It’s simple. Griptape is abrasive and most laces break. Ironlace Skate Laces won’t! Made from the same fiber as our Ironlace Boot Lace these laces drastically outperform stock laces. 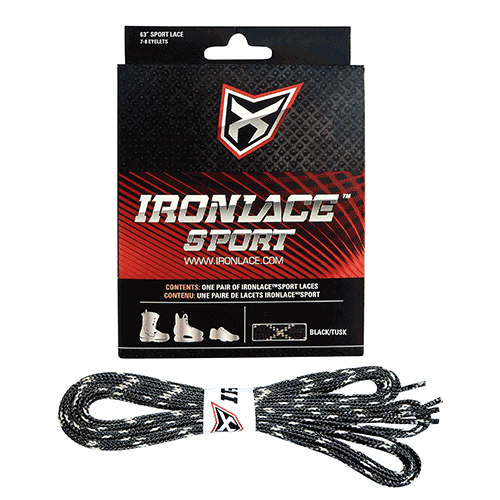 Ironlace Skate laces DON’T STRETCH, STAY TIED and are 20X more abrasion resistant than kevlar. Laces come in 33″ 45″, 54″ and 63″ for skate shoes. Get 33″ if you’re putting them on classic loafer-style vans. 45″ laces will fit most standard skate shoes with 5-6 eyelet pairs. 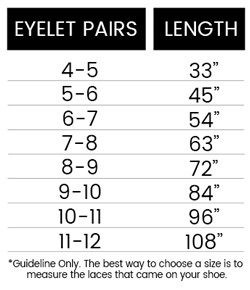 Get 54″ shoelaces if your shoes have more than 6 eyelet pairs like on mid-top shoes and get 63″ laces for high-tops. We know you'll love these laces. 781 Customer Reviews and Counting on Amazon.com! I bought these for some leather shoes I use as work shoes. The shoes are ones with only two sets of eyelets, so it is hard for me to find heavy-duty laces for them, which usually come in longer sizes. I kept having sets of laces break. So I decided to look for the most heavy-duty laces I could find. I hesitated because of the cost, but ultimately I'm happy with the result, at least so far. One pleasant surprise is how well they hold without slipping when tied. Something about the weave helps them grip each other when tightened. pair you ever buy. I'm a union ironworker in Philadelphia. I burn, weld, climb and slide down steel columns and I've now transferred the same laces into my fourth pair of boots. They've lasted more than a year and a half and are no worse for wear. I used to replace my old ones every month or so. They are THE BEST! I am a 30 year veteran of Wildland Firefighting. I have gone through dozens of pairs of leather laces over the years. Wish these laces had been around years ago, I would have saved a lot time and money replacing laces. High quality product and very durable. Very pleased and Highly recommended for persons that work out in the weather or in adverse conditions. Purchasing these laces supports RLCB. They are an organization that employs people who are visually impaired.